2 When dilute hydrochloric acid was reacted with solid B, a colourless gas which extinguished a buming splint was produced. When an aqueous solution of solid B was tested with a blue litmus paper, the paper turned red/ pink. 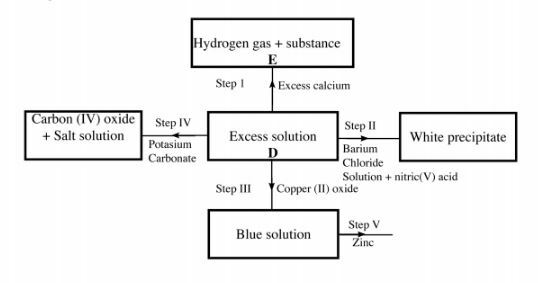 3 Dry ammonia gas was passed over heated lead (II) oxide and the products passed over anhydrous copper (II) sulphate as shown in the diagram below. 6 100 cm3 of a sample of ethane gas diffuses through a porous pot in 100 seconds. What is the molecular mass of gas Q if 100 cm} of the gas diffuses through the same porous pot in l2l seconds under the same conditions? 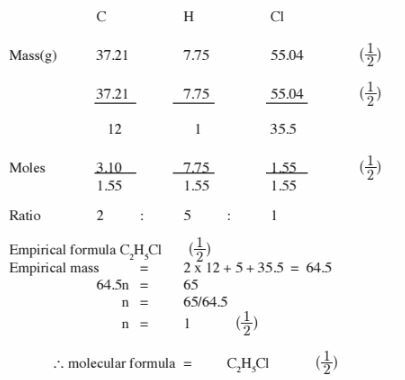 9 The table below shows the relative molecular masses and boiling points of pentane and ethanoic acid. 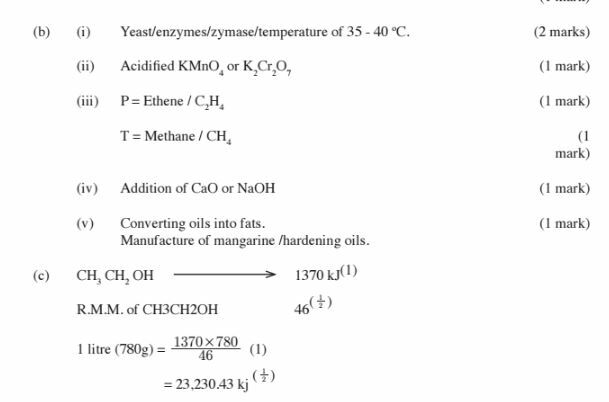 Explain the large difference in boiling point between ethanoic acid and pentane. (2 marks) 10 One of the ores of copper has the formula, CuFeS2. ll Study the ﬂow chart below and answer the questions that follow. 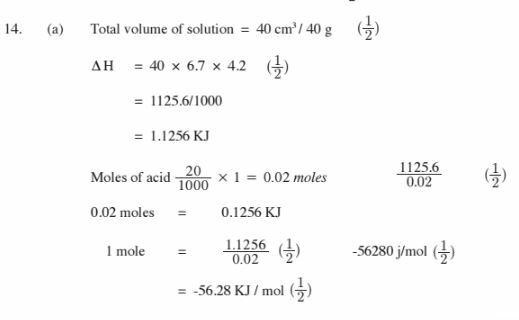 12 The table below shows the pH values of solutions A, B, C and D.
15 Study the set-up below and answer the questions that follow. 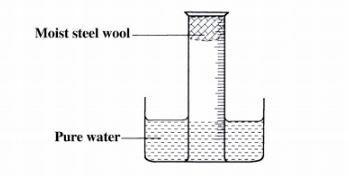 16 A measuring cylinder ﬁtted with moist steel wool was inverted in a trough of water as shown in the diagram below. 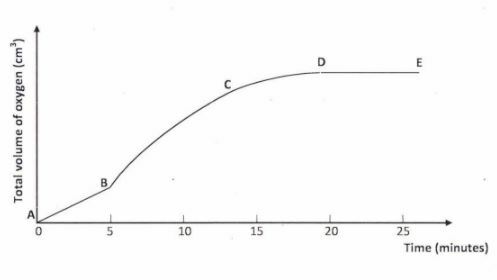 (b) Explain Why the rate of reaction is found to increase with temperature. 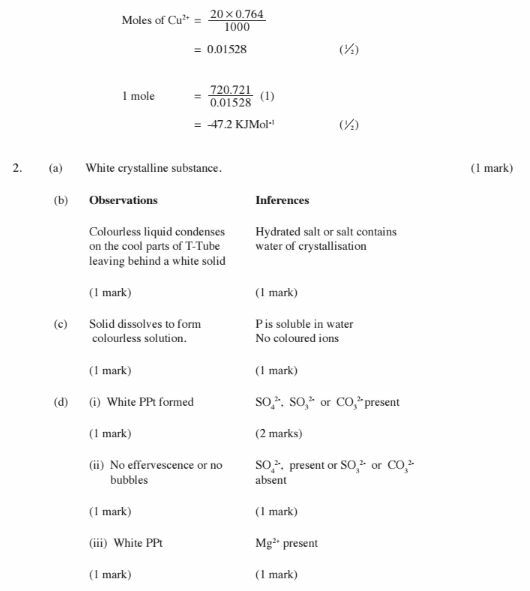 (2 marks) 18 Use the part of the periodic table given below to answer the questions that follow. (Letters are not the actual symbols of the elements). 20 In the contact process, during the production of sulphur (VI) oxide, a catalyst is used. 22 The set up below was used to separate a mixture of methanol and propanol. Study it and answer the questions that follow. 23 Study the ﬂow chart below and answer the questions that follow. 28 A student used the set up below to prepare a sample of nitrogen gas. (b) Give a suitable metal M for use in the combustion tube. (b) The table below contains atoms that form common radicals. Complete the table to show radicals formed from various atoms. 30 A gas jar full of chlorine water was inverted over water and allowed to stand for sometime. 1 (a) The set-up below was used to prepare dry hydrogen chloride gas, and investigate its effect on heated iron ﬁlings. 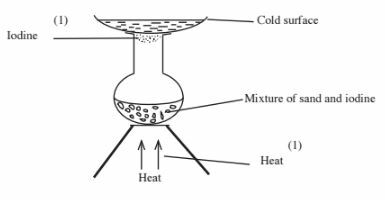 (c) The diagram below is a representation of an industrial process for the manufacture of a bleaching powder. 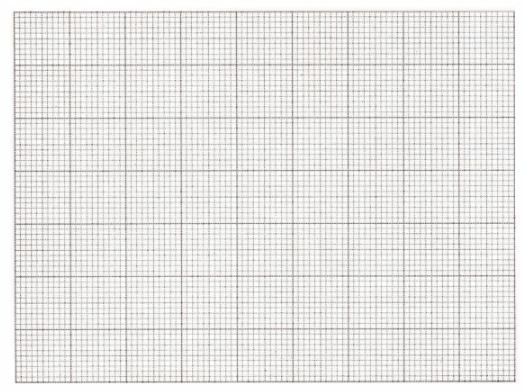 2 (a) The grid below represents part of the periodic table. Study it and answer the questions that follow. The letters are not the actual symbols of the elements. (b) Study the ﬂow chart below and answer the questions that follow. (b) A solution of hydrogen peroxide was allowed to decompose and the oxygen gas given off collected. After 5 minutes, substance G was added to the solution of hydrogen peroxide. The total volume of oxygen evolved was plotted against time as shown in the graph below. 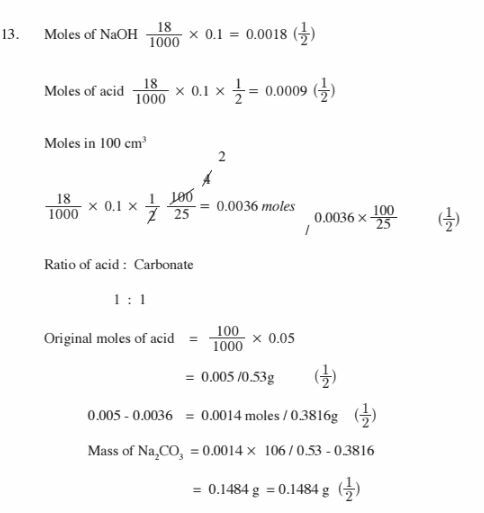 5 (a) The scheme below shows some of the reactions of solution D. Study it and answer the questions that follow. 7. 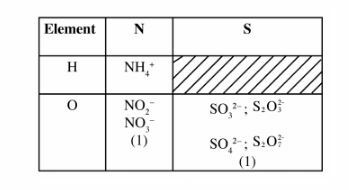 (a) Dissolving of potassium nitrate tn water rs an endothermic process Explain the effect of increase in temperature on the solubility of potassium nitrate (b) The table below shows the solubility of potassium sulphate and potassium chlorate (V) at different temperatures. - solution J containing copper (ll) ions. solution K, 0.1 M sodium thiosulphate. 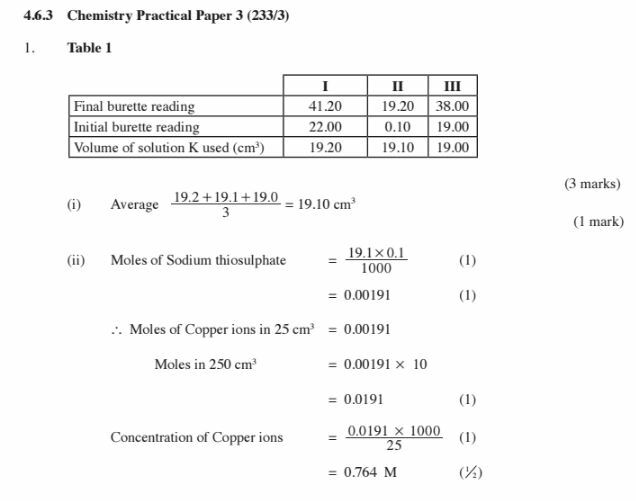 aqueous potassium iodide, solution L.
- enthalpy change of reaction between copper (ll) ions and hydroxide ions. (a) Using a pipette and pipette ﬁller, place 25.0 cm-‘ of solution J in a 250 ml volumetric ﬂask. Add distilled water to make up to the mark. Label this as solution J2. Retain solution J for use in procedure II. Place solution K in a burette. Using a clean pipette and pipette ﬁller, place 25.0 cm3 of solution J2 in a 250 ml conical ﬂask. Add 10 cm3 of potassium iodide, solution L.
Shake well, then add 2 cm3 of starch indicator, solution M. Titrate until a blue-black colour appears and continue titrating until the blue-black colour just disappears. Record your readings in Table 1 below. (c) Repeat step (b) two more times and complete Table 1. (a) Using a clean burette, place 5.0 cm3 of solution N into each of six (6) test-tubes. (b) Using a 100 ml measuring cylinder, place 20 cm3 of solution J in a 100 ml plastic beaker. 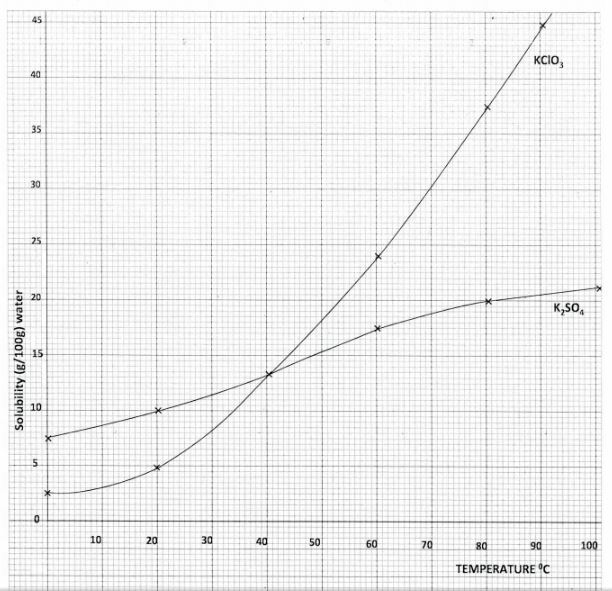 Measure the temperature of solution J and record it in Table 2 below. (c) To solution J in the beaker, add sodium hydroxide, solution N from one of the test-tubes. Stir the mixture with the thermometer and record in Table 2, the maximum temperature reached. Continue with step (d) IMMEDIATELY. 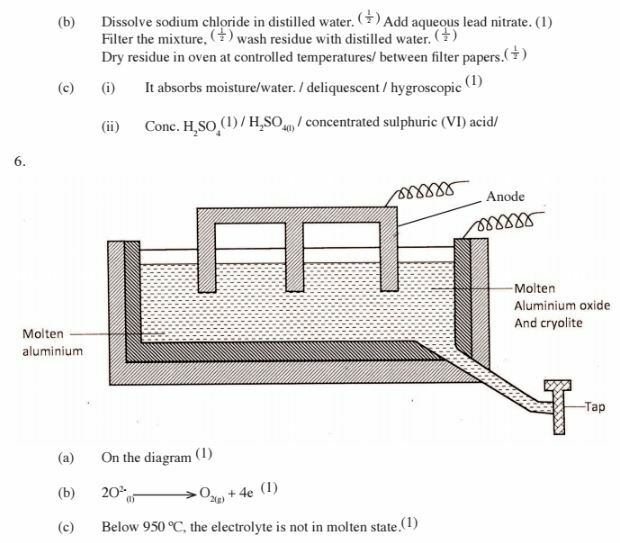 (d)Add the sodium hydroxide, solution N from another test-tube to the mixture obtained in (c) above, stir and record the maximum temperature reached in Table 2. 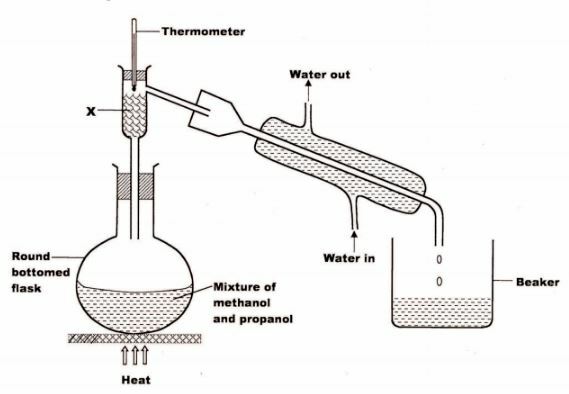 Continue adding the sodium hydroxide, solution N from each of the other four test-tubes, stirring the mixture and recording the maximum temperature each time and complete Table 2. (Heat capacity I 4.2 J g"k", density of the mixture I 1.0 g cm'3). 2 You are provided With substance P. Can"y out the tests below and Write your observations and inferences in the spaces provided. (b) Place about one-third of substance P in a dry test-tube and heat it strongly. (c) Place the remaining amount of substance P in a boiling tube. Add about 10 cm3 of distilled water and shake well. 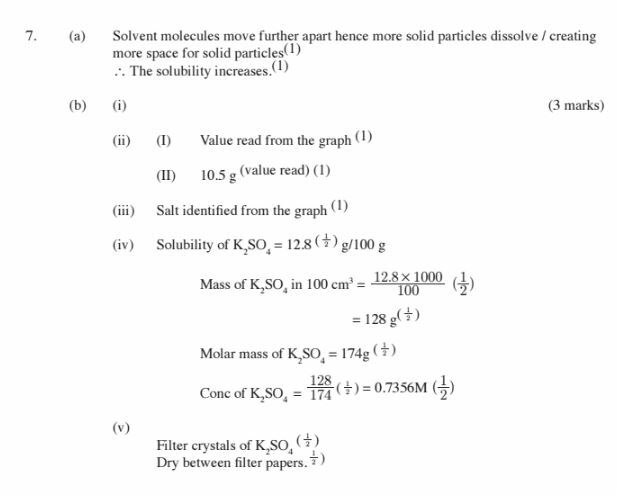 Retain the mixture for tests in (d) below. 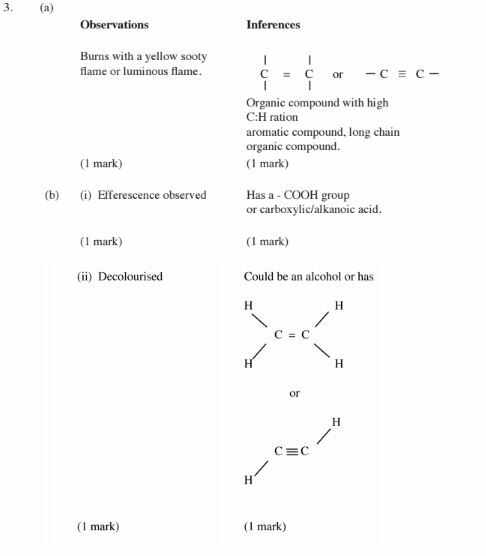 (d) Use about 2 cml portions of the mixture obtained in (c) for tests (i) to (iii) below. (i) Add two to three drops of aqueous barium nitrate to the mixture. 3 You are provided with an organic substance Q. Carry out the following tests and record your observations and inferences in the spaces provided. (a) Place about one-third of substance Q on a metallic spatula and ignite it with a Bunsen burner ﬂame. (b) Place the remaining amount of substance Q in a boiling tube and add about 10 cm} of distilled water. Heat the mixture and allow it to boil for about 30 seconds. Divide the mixture while still hot into two portions. (i) To the ﬁrst portion, add solid sodium hydrogen carbonate provided. 9. 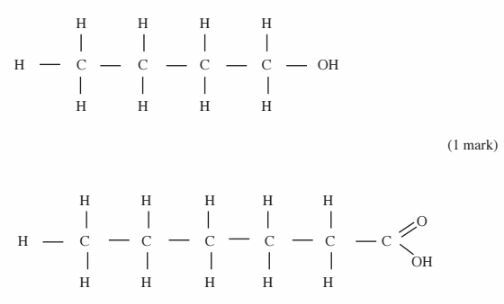 The molecules of ethanoic acid interact through strong hydrogen bonding (1) forming a dimer while molecules of pentane have weak van der waals forces. 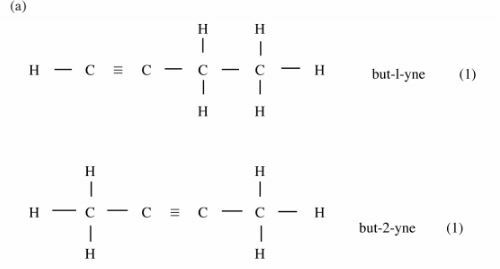 (1) NB/ Ethanoic acid has hydrogen bonds while pentane does not have. Lead (II) hydroxide is amphoteric. Affected by acids/Not easily recyled. (b) (i) Both CaCl2 and MgCl2 have mobile ions in molten state (1) while both CCl4 and SiCl4 are molecular compounds with no mobile ions (1). 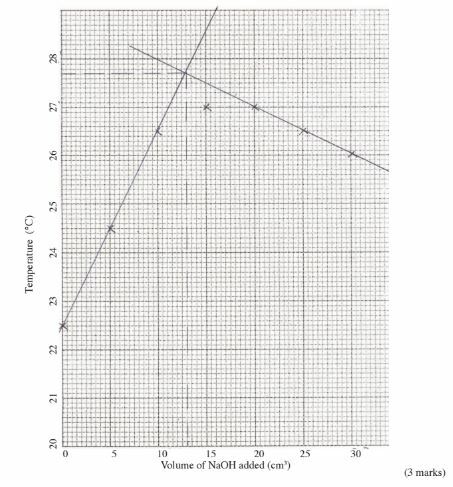 (ii) Neon has molar mass of 20 While Flourine has a molar mass of 38 (l). Therefore Neon diffuses faster. (l) Since it has a lower molecular mass the faster the rate of diffusion. Manufacture of other organic compounds.